MoMo 2.0: One leg, or two? I am sure that when foreigners first visit an American grocery store, they think that some of our items are a bit odd, and they cannot imagine what we do with those things when we get home. Knowing that, I try to stay open-minded when I go to a new place's grocery store, but just in case, I ALWAYS have a camera on hand! Our trip to Spain was no different. I scored boxes of GOLDEN GRAHAMS cereal, a bag of Chips Ahoy cookies and a few loaves of REAL WHITE BREAD like from America! However, there was one thing I encountered in three different stores that made me stop, ponder, and of course, snap a photo! My only questions about this particular item are: One leg or two? Exactly how many pig legs do you need to feed a family? And what size ovens must they own to cook these things? Or do you even cook them? Instead do you just set this on the counter with a jar of mayo and a loaf of that yummy white bread and then tell everyone in the family that they are having "pulled pork sandwiches" for lunch!? Oh yikes - I wouldn't have a clue what to do with that! Ohhhh that's delicious, scrumptious ham! I would totally have bought one. 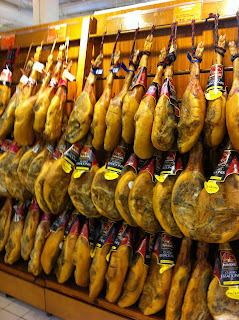 Fantastic Jamón Serrano...Please tell me that you brought one back to DK with you!!! I think you just need a "ham stand" and a sharp knife and then you cut thin slices ready to put in your sandwich. I know what you mean. We came back from vinterferie on Tenerife with a box of Tetley's Teabags so my mum can have something to drink when she visits us here in dk next month. Now that I'm old, I would cook those pig legs by going to a restaurant. I think the ham is dried, not baked, so you need a smoker if you wanted to DIY. Although I know some that just hang it in the garage (obviously they don't have cats). Then to serve you just slice thin sections off and eat. A leg goes a long way. 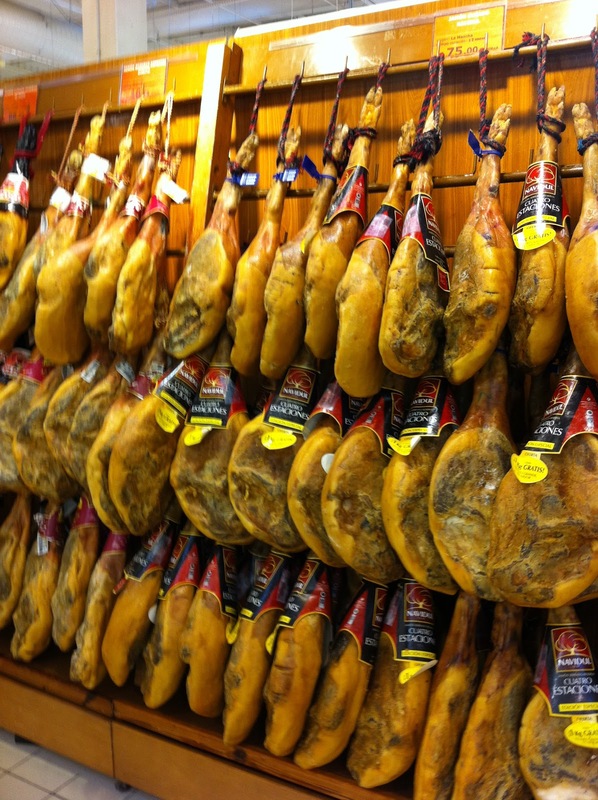 Next time the Danish Boy and I go to Spain, we're driving so that we can bring back legs of ham and cases of wine. Oh, southern Spain, I <3 you! Perhaps you would like to join me for my Expat Blog Linky Party on March 19th? Hope to see you then, if not sooner.